← Fast Moving Light Abruptly Stops. Silent Transparent V Shaped Craft. 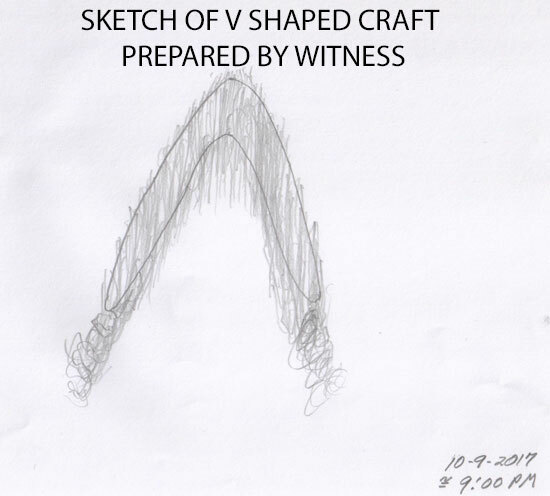 SKETCH OF V SHAPED CRAFT BY WITNESS. Description: I just observed a V shaped craft flying above my house heading approximately 242 degrees Southwest from where I live. My sighting was at about 9:00 PM on 10-9-2017. It bothered me and because my wife didn’t see it, when I tried pointing it out. I just looked up (don’t know why) and it caught my eye. There appeared to be water vapor rolling off of it which outlined it. It could be because it is cold here and it snowed earlier today. I couldn’t see it if I looked at it directly, but off to just the side of it as it was flying by at a steady cruising speed. It was big and I couldn’t determine elevation, but it seemed to be quite low. There was no sound and it was pretty much invisible or translucent. I drew a picture of it to show my wife what it looked like with water vapor rolling off of it. It was kind of like your breath in cold weather so slight and then disappears. There were no contrails. It happened quickl. There was no time to take a picture. It bothered me so, that I thought maybe somebody else has seen something like this when I saw your picture on the internet. Your picture is exactly what I saw as far as shape and approximate size. I live in Wheat Ridge, Colorado, USA. It is part of the Denver Metro area. Denver International Airport is close by. We see all sorts of different aircraft with the blinking lights, etc. I have never seen anything like this craft. It was an interesting, but disturbing feeling. Note: The witness is referring to a photo on another blog. The location of this photo is unknown. This entry was posted in silent, Sketch, UFO Sightings 2017, UFO Sightings Colorado, Unidentified, V shaped and tagged Low flying, Transparent. Bookmark the permalink. 2 Responses to Silent Transparent V Shaped Craft. I have seen this craft over 15 times. My wife ignores me. I can’t stand it either. You’re not alone ha ha ha. I have taken specific notes as to dates, times, and directions, as well as the actions preformed by the craft. New Year’s Eve last year I saw a Y formation of bright white orbs snake over my house as well. There was no sound. Hey! Check out this one! This is my experience from 10 October 2015 in Norway.